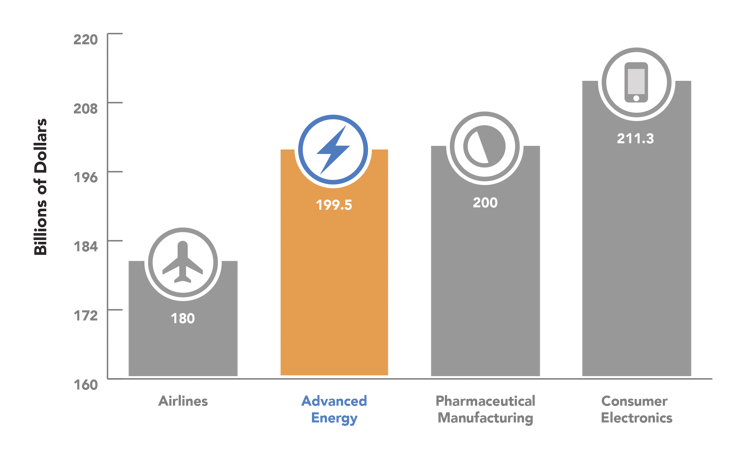 Advanced energy is a nearly $1.3 trillion global industry, as big as apparel and almost four times the size of semiconductor manufacturing worldwide. U.S. advanced energy market is $200 billion, up 14% vs. 2013, 5x the growth rate of the U.S. economy overall. This is the third annual report of market size, by revenue, of the advanced energy industry, worldwide and in the United States. Prepared for AEE by Navigant Research, Advanced Energy Now 2015 Market Report is the most comprehensive assessment of advanced energy markets ever compiled. Please fill out the form to view the full report.